Stir sugar and vinegar in small saucepan over medium heat until sugar dissolves; remove from heat. Mix cabbage and 1/2 c green onions in medium bowl along with red bell peppers. Pour vinegar mixture over cabbage and toss to coat. Season with salt and pepper and top with 1/4 c green onions and sesame seeds (Dressing can be made the day before. 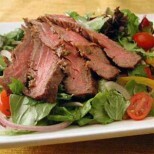 The salad can be made a couple of hours before you grill the round steak so that the flavors have more time to blend in). Grill steak until cooked to desired doneness, about 3-4 min per side for medium-rare. Transfer to work surface. Let rest 10 minutes. Slice steak thinly against the grain. 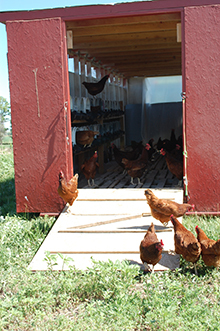 This entry was posted on Tuesday, September 13th, 2011 at 1:28 am by Cottonwood Creek Farms. Bookmark the permalink.